The medium sized KM 305 range of cardboard balers are designed to help shops, hotels and other businesses with medium-to-large volumes of cardboard and plastic waste save time, money and energy. The KM 305 cardboard baler can help your business cut costs by reducing the number of bin collections. With low running costs and single phase power setup, the KM 305 is good for your business’s bottom line. With options to either rent or buy balers for sale, you can make a decision that is best for your business’s budget. Improve productivity and increase efficiency of your team with the KM 305 that comes with an automated bale out feature, a long, vertical and deep pressing chamber and a wide door opening. All of which work seamlessly to ensure that you get dense bales automatically and quickly. 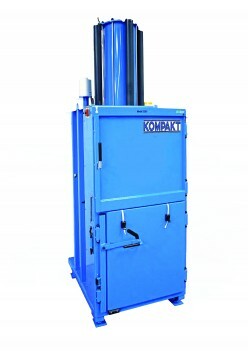 The KM 305 cardboard balers use single power phase and have low running costs. Plus your business will cut down on collection frequencies, reducing carbon emissions as well. The retail sector disposes of huge amounts of packaging waste across the UK. The KM305 baler allows shops and other high street locations to reduce waste pick up and therefore scale down costs. This machine allows hotels to bale their waste, reducing pick up costs and increasing recycling rates. These machines are often seen in service areas and can plug straight into a 240v socket. What if I need a bigger machine further down the line? There are various options available depending on if you wish to rent or buy a machine. Trade ins and swaps are possible, just speak to a member of the team.